"Rockstar's man on the scene told GamingExcellence that they had begun testing the various plots and that the developers were considering the possibility of having an open world completely unlocked from the start of the game. We also understand that the game's multiplayer mode, unseen in the GTA franchise since GTA2 in 1999*, is aiming for at least 16 simultaneous players, with more than just the usual deathmatch mode." Normally, it's Rockstar that has to deal with complaints about their game content but in this case, Rockstar is doing the complaining. Apparently they have demanded that content parodying GTA be removed from EA's new Simpsons game. It is likely that Rockstar's lawyers are just trying to protect their property but it still seems like a very hypocritical move, considering that all of Rockstar's GTA games contain many parodies of movies and even some games. "Due to some bugs/crashes/problems that were not found during beta testing of 0.2.2, we're releasing the 0.2.2 R2 client. Please update to this version. This is a client only update. The 0.2.2 server does not need to be updated. Some crashes related to models/pickups. Collision processing issues (may fall through the ground). Chat window wrapping server messages. Texture rendering if your graphics card uses a custom d3dx9_25.dll. There may be another 0.2.2 bugfix release before we start work on SA-MP 0.3." Chat window is now scrollable with upto 5 pages of text (50 lines). Chat window now wraps text properly over multiple lines. Chat entry improved, it allows upto 128 character messages, supports selection, copy and paste etc. All text rendering has been heavily optimised. Chat text now has no noticable impact on framerate. Name tags cannot be seen through walls/objects. A car mod shop crash applying certain car mods has been fixed. Pickup limit increased to 400. The server can now disable all interior entrances/exits. Native sqlite database support for pawn. Sqlite is a lightweight alternative to the mysql plugin. The name tag drawing distance can be set from the server. Insane stunt bonuses can be toggled on/off by the server. 0.2.2 will use the second major version of SAC. Player head movement sync added. Player's characters will look in the direction their camera is looking. A new cellphone action enables players to hold a cellphone and look like they're on a call (useful for pen1 based scripts). New usable skins; Tenpenny, Pulaski, Hernandez, Ryder, Smoke, Sweet, Mafia Boss. Bandwidth and ped sync improvements. 0.2.2 will consume less server bandwidth than 0.2.1. Fixed bug with setting player colors of players 100,101,102. Increased timeouts to prevent connection loss. Decreased CPU time required to process vehicles on the client. Fixed animation problem with fire hydrant and spray can. Fixed nametags with no player issue. Fixed an issue where the client wasn't displaying "You are banned", "Server is full." messages. Sadly, GTA IV release date has been delayed from October 2007 to fiscal 2008 (sometime in Feb, March or April) due to additional development time required to complete the title. If you are over 18 and can call a US phone number, you have a chance to get your voice on the radio of GTA IV or a future Rockstar game. Check the links below for more information. A short comment on GTA IV multiplayer was posted in an xbox.com news article. "In addition to the exclusive content for Xbox 360, GTA IV will feature a multiplayer mode on Xbox LIVE that will match the drama and intensity of Niko's solo mission." 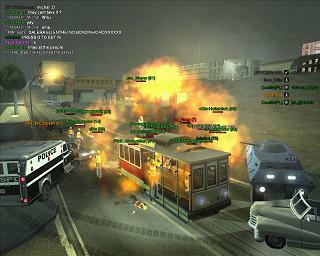 Check out this fan made recreaction of the the GTA IV trailer in the San Andreas engine. 2007-06-29 - GTA IV trailer "Looking for that special someone"
The 2nd GTA IV trailer is up on yahoo.com, rockstargames.com and even XBOX 360 Media Marketplace. "Tanks, sniper rifles, trains, trams, gang zones, bug fixes and more..."
You must update to this version. Old versions will no longer work. I don't normally force updates but I've been allowing old versions to connect for a long time and it's just much easier to support if everyone is using the latest and greatest. If you preferred another version or have a problem with this version then contact me. IRC password is now displayed as asterisks. It's still saved in the registry as plain text. Wario5 updated Wario Town to work with the current version of Game Hunter and he made a new map with bots, called Suburban Anarchy. DON_AWI, Cuban Pete, Bit and others are creating a short movie using the GTA2 engine. They want ideas for a story and any help they can get. Read this GTA2.info forum post for more information. Fox recently aired an episode of "King of the Hill" titled "Grand Theft Arlen". 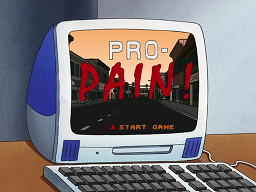 It featured a Grand Theft Auto style game called "Pro-Pain". I've never been a fan of King of the Hill and I can't believe it lasted this long but for gamers and GTA fans, this episode is actually worth checking out. Extract to your gta\gtadata folder and run "viewer.exe -c 1". You can't drive cars yet. Push F4 to spawn the player. Top Down City is a GTA clone being developed by Jernej L. This video demonstrates explosions, shock waves and explosion jumping. When trying to join a game, GH was sending the comment from the most recently hosted game to mpaddon. This would show the wrong comment if the game you tried to join was not the most recently hosted game. It now uses the comment from the game you tried to join. When you click on a name in the player list, the player list is disabled and focus is given to the chat window. The player list is enabled again as soon as you you type a character but the chat Window will keep the focus. If you try to join a Hamachi game, there were sometimes multiple popups saying click OK. Hopefully that's gone now but it's not fully tested. Bug: Now it displays "Error while trying to join: Index out of bounds - Line: 50"
Bug: Broke the hyperlinks in the topic. They still work in the chat history. It will be fixed. Bug: Windows 98 doesn't add carriage returns to the end of lines in this version. 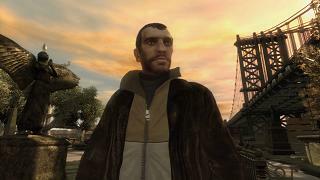 Rockstar Games site has been updated with a counter to the release of the first Grand Theft Auto IV trailer. The trailer will be released on the 29th of March. Fixed a rare error when launching GTA2 in singleplayer "1p error: Overflow Line: 360". "Click OK when Hamachi has finished loading and logging." changed to "Click OK when Hamachi has finished loading and logging in." Some of your Windows may shrink to a tiny size if your GTA2 language is not set to English and you have "Enhance GTA2 network screen" option enabled. I recommend you set your GTA2 language to English or untick "Enhance GTA2 network screen" in the settings. I will try to fix it in the next version. Typing /wi or /whois without a name will no longer trigger an "Invalid procedure call or argument"
If you are using the enhanced GTA2 network screen, alt + c will no longer be sent. The button is pushed using a more reliable method. If a host had not selected a country and their hostname ended in .com, .net or .org, then two characters would be missing from the MMP name. This prevented people from joining their game. Joiners would receive a message saying they didn't have the map since it was looking for a map with two letters missing. You can try to join a game by clicking anywhere on the row (FullRowSelect). Previously you had to click in the Game column. If you have less than 100 MMP files then your custom MMPs will no longer be moved. IRC name is displayed in titlebar instead of a label. The message "If it is your nick, type /msg NickServ IDENTIFY password" is now hidden. You don't need to type that command, it is sent automatically. GTA2 can now be launched from a network path (UNC path). Previously it had to be installed on a local drive. ZeroXP is creating an open source GTA engine: Open GTA. It's not a playable game yet but he has been working on it for a while. 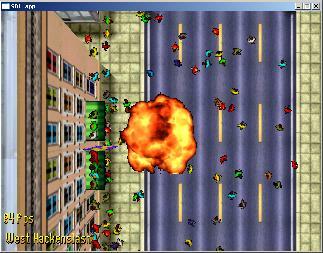 Currently it can open the GTA1 map and graphics files and allows you to scroll around the city. There is a preview available for Windows and Linux. It should be fairly easy to port to other systems, provided they have the required libs.